Produces quality control plots. The quality control plots include density plot, box plot, pairwise scatter plot between microarrays, pairwise MA-plot between microarrays and sample relations (hierarchical clustering). The input is a matrix containing ProbeIDs and raw or normalized intensity values at log2 scale. First column of the input is the ProbeID followed by columns each representing one array. 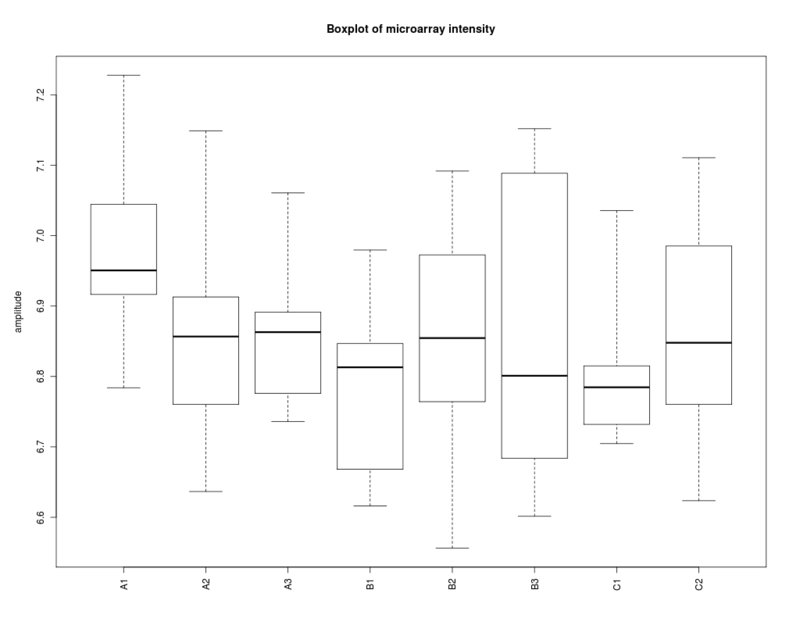 In density plot, box plot and sample relations plot all samples are plotted on the same figure. In pairwise scatter plot and MA-plot max 4 and min 2 samples are plotted on the same figure. in LogMatrix Mandatory Input matrix of data. plotType string (no default) Comma-separated list of plots, e.g. "density,boxplot,pair". density = density plot; boxplot = box plot; pair = scatter plot; MAplot = MA-plot; sampleRelation = sample relations (hierarchical clustering). sectionTitle string "QC plots" Section title.